New reports obtained by Ohio Right to Life reveal Planned Parenthood’s neglect over the past few years of its patients and state protocol regarding the widely-used abortion pill RU-486. After sending young women home with the chemical abortifacient, many patients returned to clinics with complications such as “moderate to severe bleeding” and “infection.” What’s more, a total of 35 cases were reported as “incomplete abortions” -- a situation which can cause birth defects for the child if the mother continues with the pregnancy. Perhaps most disturbing, however, was Report #7, which reads the patient never followed up with her clinic after they sent her home with the drug. This leaves Ohio Right to Life and other pro-lifers to wonder, what happened to that unborn child? Report #3: Dr. David Burkons of the Planned Parenthood of Northeast Ohio reports his patient was hospitalized, suffered “severe bleeding” and had to receive a transfusion. Report #11 - Dr. Sarah Smith reported her patient suffered hematometra, an accumulation of blood in the uterus, according to wisegeek.com. The Food and Drug Administration protocol in Ohio states women can only take the abortion drug without supervision up until the 49th day of pregnancy. Planned Parenthood, however, has sent girls home as late as the 63rd day, according to Ohio Right to Life. I spoke today with Laura Beth Kirsop, Ohio Right to Life’s communication director for a reaction to these unsettling reports. 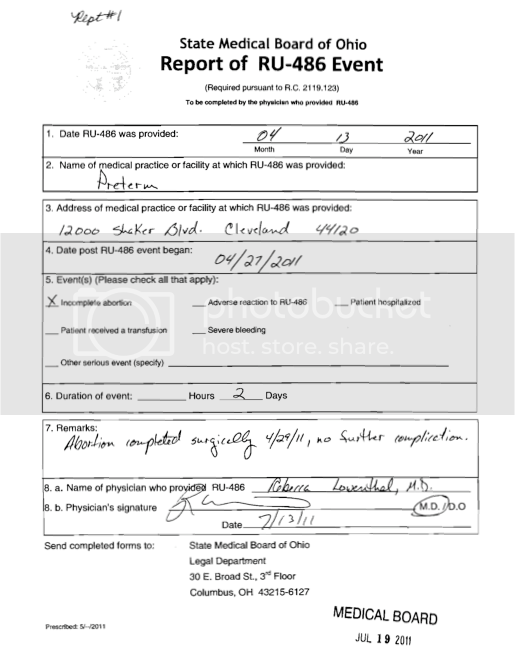 The pro-life organization initially requested these RU-486 reports in order to learn more about the chemical that was gaining national attention. The findings only confirmed their suspicions that the abortion drug is indeed dangerous. As for the patient who never followed up with the abortion clinic, Kirsop said they can only surmise what became of that unborn child. Ohio Right to Life is not only hoping, but acting. In light of the disturbing revelations, The pro-life group is urging Attorney General Mike DeWine to expedite the litigation against Planned Parenthood. RU-486 has killed fourteen women and injured more than 2,000 women in the US. These statistics, along with the new reports from Ohio, paint quite a different reality from the positive way the pill is portrayed on Planned Parenthood’s website -- "Safe and effective."